This 1998 PC classic is actually a remake of an old classic arcade game, at least in theory. In reality, apart from featuring tanks, the two games have almost nothing in common. 1998’s version of Battlezone is set in an alternate 1960’s, where America and Russia take the cold war into space. As a tank commander, you’ll not only have to duel with other tanks and enemy vehicles, but also command your own forces on the battlefield. This mix of frantic combat and real time strategy was met with critical acclaim when the game was launched, though the game was never the commercial success it undoubtedly deserved to be. Battlezone has been officially released for free. We recommend that all users, even those of you with an original copy, download and use the games installer available here. If you are interested in playing the expansion pack, be sure to download the Red Odyssey installer too. Both downloads come as zip files. To install them, simply open the zip folder and run the executable file within, then simply follow all on-screen prompts to install the game. A note about save games – Like many older games, Battlezone places its save game files in the same directory that it is installed to. This can cause problems on more modern versions of Windows as programs are not normally permitted to write to the program files directory. To avoid this problem, either install the game to an alternate location (e.g c:\Games\Battlezone) or manually edit the permissions on the Save directory within the Battlezone folder. A tutorial on how to do this can be found here. To start the game, simply launch it from your Start menu or Start screen. Before you start the game, we strongly recommend that you disable any secondary monitors if you intend to play in full screen mode. 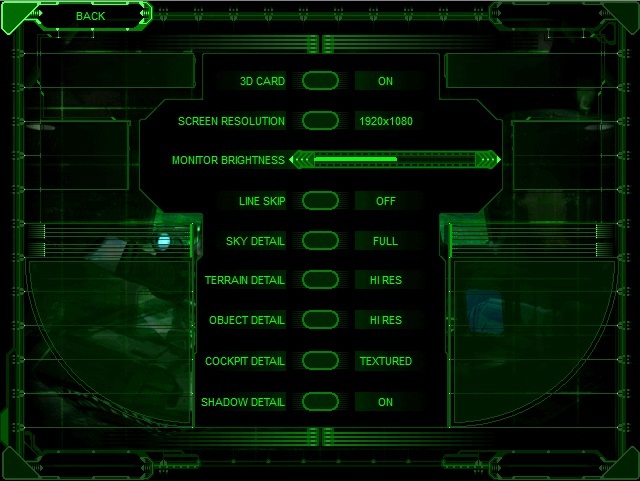 Most of the visual quality settings can be found by starting the game, clicking on “Options” and then “Graphic Options”. As this is an older game, most modern PCs can run it on the highest settings without any issues. The picture below shows the highest settings available to configure in-game (click the picture to enlarge it). Obviously, if you don’t have a 1080p monitor/TV you may need to change the screen resolution to suit. Since Battlezone was launched before widescreen displays were common, certain game elements may appear stretched if you play with a widescreen resolution. Save the file then run the game again, if the game starts without an error then you’re all set. If instead you see an error saying your card does not support a MultiSampleType of 8, go back and edit the render.cfg file again, this time trying a value of 7. Keep reducing the value until the game launches without a problem. You may need to reduce MultiSampleQuality too, but if you set this too high the game should tell you the maximum value this can be set to. When you have successfully tweaked these values, the games graphics will be much smoother. Controllers can be configured in Battlezone by starting the game and then clicking on “Options” and then on “Input Configuration”. If you want to use a game controller of any kind, you should then click on “Joystick”. Thanks to the fan community Xbox 360 controllers are fully supported. In practise we found using the 360 controller a little awkward. Often our tank did not want to go full speed, which made completing jumps (yes your tank can jump) somewhat tricky. You may wish to increase joystick sensitivity if you have similar issues, or even use Xpadder to configure a distance zone to make sure full throttle is applied when the stick is fully pushed (see the techniques we used in Prince of Persia for an example). We didn’t spend too long on controller issues for this game because it’s not really possible to play the game with a controller on its own. To issue commands to your units while you play, you will need to use the keyboard, either on its own or in tandem with a game controller or joystick. If you are interested in playing the game in multiplayer or discovering some new mods and maps there are not one but two fan communities you may wish to visit. The Battlezone1.org forum here and the Battlezone Club forum here. If you have never played the game before, we strongly recommend doing the “Combat Exercises” before you get into the game. You can access these by clicking “Single Player” on the main menu and then clicking “Combat Exercises”. I tried to start it, but all I got was a green cursor over a black screen. no option to install the game on the site.